Carol Super Vu-Tron 6/4 Type W portable power cable features black colored that jacket withstands daily wear and tear. The EPDM insulation resists electrical leakage and offers protection against environmental threats. Cable has voltage rating of 2-Kilo-Volts. Sunlight-resistant cable withstands severe environmental conditions. 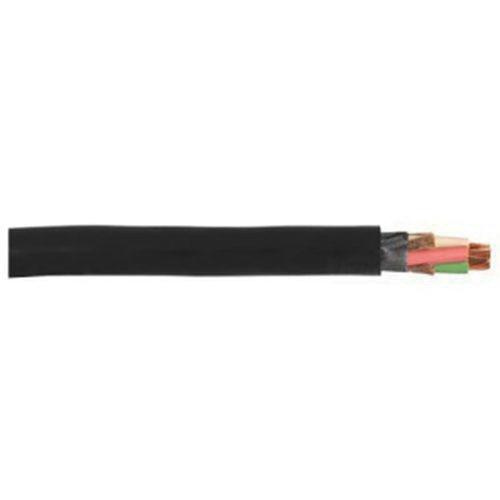 It has operating temperature range of -40 to 90 deg C. This 1.085-Inch OD, annealed bare copper cable is ideal for pumps, belt drives, belt take-ups, battery chargers, conveyors and miscellaneous portable equipment. This 2000-ft cable comes in a reel. Cable is UL listed, CSA certified, MSHA approved and RoHS compliant.